My friends and family know that I prefer not to go to chain restaurants. I like to patronize local businesses. When my husband and I decided to try BJ’s Brewhouse, we did not know it was a chain. There is not one in our area. It is the typical American bar restaurant. They have burgers, tacos, wings, nachos, flatbread, eggrolls, etc. But, let me fast forward right to the dessert. We went to BJ’s on a Tuesday. 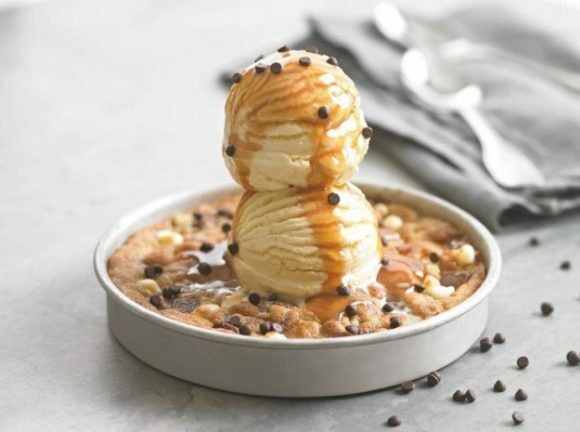 They have a dessert called Pizookie. I thought that was a very weird name. 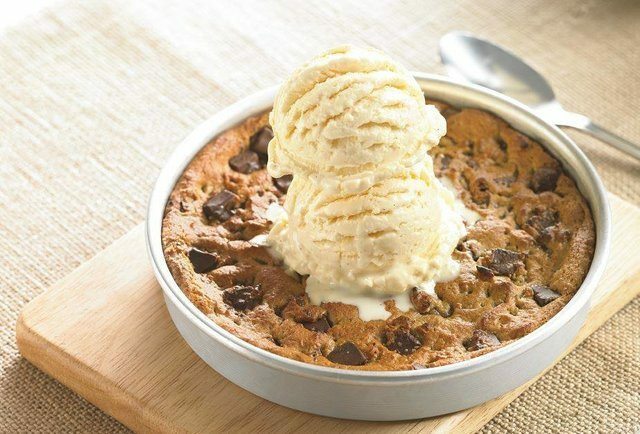 It so happens that this ‘Pizookie’ was half off on Tuesdays. After we finished lunch, I decided since we were out of town and I was not counting calories to just go for the Pizookie! Of course the waitress had to hype it up and tell us about her favorite Pizookies. They had these flavors – cookies ‘n’ cream, peanut butter, chocolate chip (even gluten free), salted caramel, triple chocolate, monkey bread, white chocolate macadamia nut, chocolate chunk, etc. I still didn’t know what a Pizookie was. She explained that it was a hot cookie (flavors mentioned above) with vanilla ice cream on top. The Monkey Bread Pizookie was one of the most popular ones so we tried that. It was actually warm monkey bread with vanilla ice cream on top. The description of this was ‘fresh-baked, pull-apart treat is topped with caramelized butter, brown sugar and cinnamon, baked to a golden brown finish and then topped with vanilla bean ice cream. This sounds amazing right? And honey it was! The monkey bread was so soft and sweet. It was the perfect temperature. When I tell you it just melted in my mouth! Then, the ice cream on top was icing on the cake!! My dad is a big sweets type of guy. When something is really good he always says ‘this will make your tongue slap your brains. I love his southern sayings LOL! This monkey bread pizookie knocked my brain completely out!